Chances are that you, a colleague, a client or customer will use a calculator at some stage in the near future…and the chances are they’ll scrounge around aimlessly in the their desk drawer and fail to work out the calculator on their mobile phone.The figures will still need adding up and there’ll be a lot of head scratching and cursing words. It’s a known thing that calculators have taken a back seat to phones and tablets but there’s something these large screen electronic devices can’t do – they can’t match a promotional calculator on price/unit. 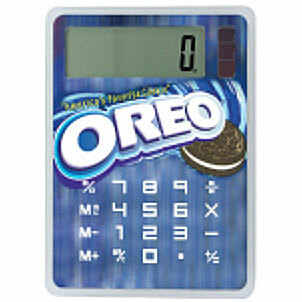 Bang per buck, you get more product from a promotional calculator than an iPhone….. In addition, you won’t find anyone willing to print your company logo on their iphone…which makes a promotional calculator a great business gift in every respect. This entry was posted in business gifts, Desk and Office, Giveaways, Promotional Items, technology products and tagged office, technology by admin. Bookmark the permalink.